I mentioned earlier this week that you all would get two tutorials in one week! This tutorial is EXTRA special because it is for a little guy named Owen. No the Tutu is not for Owen, but I have donated this outfit to an Auction where 100% of the proceeds go to this little guy! which includes a Tutu that will fit from a 3 months all the way up to a 2T(trust me I tried it and it worked), a matching shirt, and an adorable boutique style hair bow you can head on over to I Am Momma Hear Me Roar . *Please note: The auction for this entire outfit has ended. 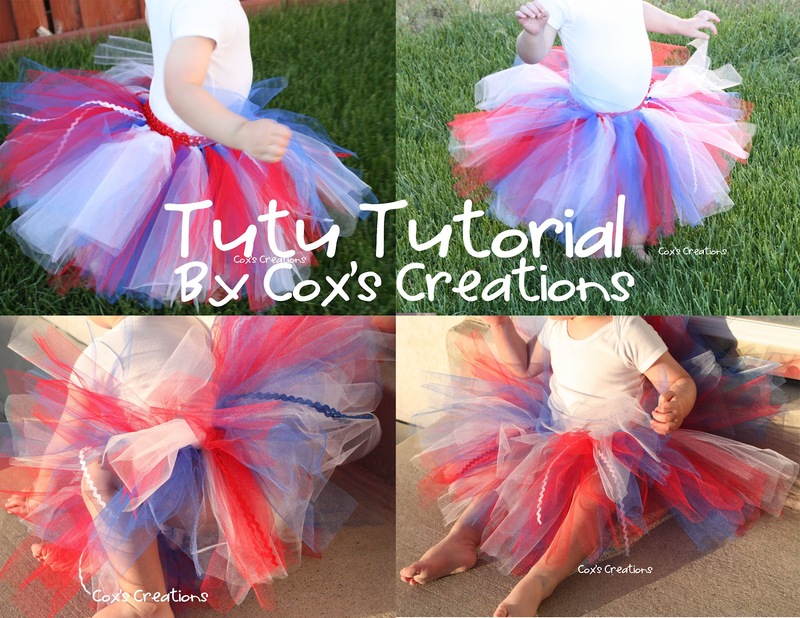 Onto our awesome Tutu Tutorial! I just love saying that! I finally found me a model that wasn't my son! 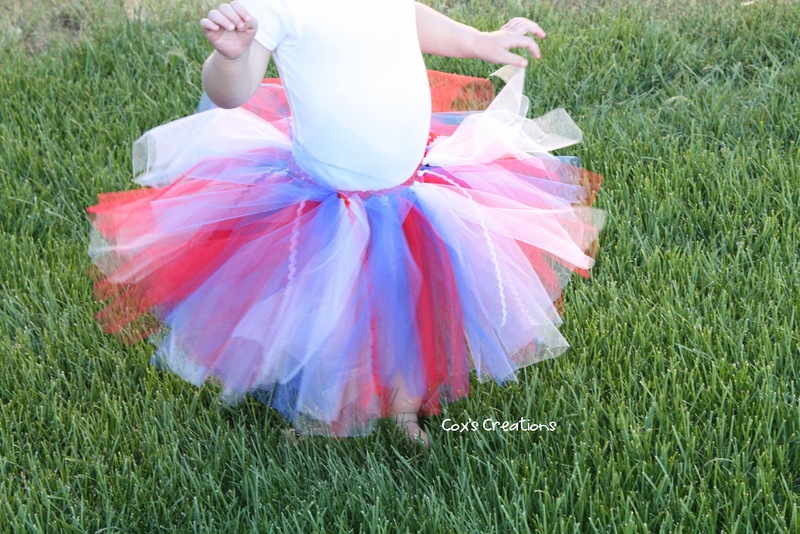 Although to protect their privacy I have done some creative cropping, you can still see the cuteness that is this Tutu! 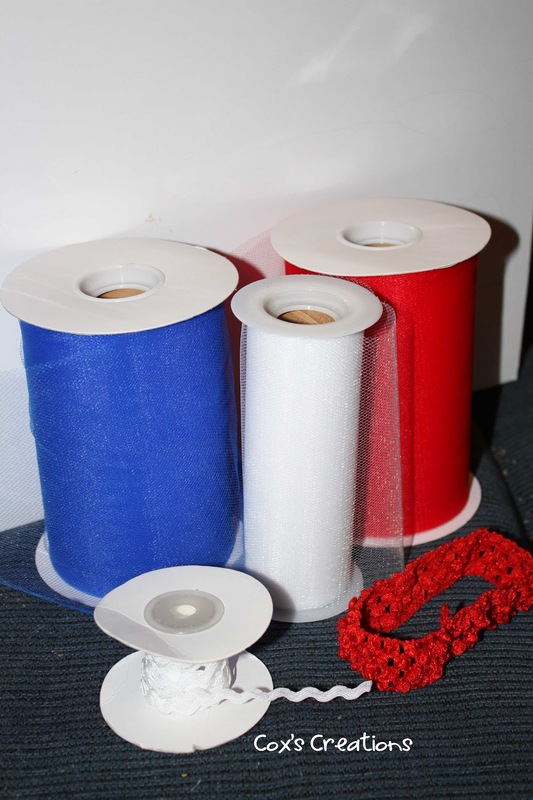 3 rolls of Ric Rac (the rolls I used are all 25 yard rolls, but you will not use any where near that much of each color) I used Red, White, and Blue as well). 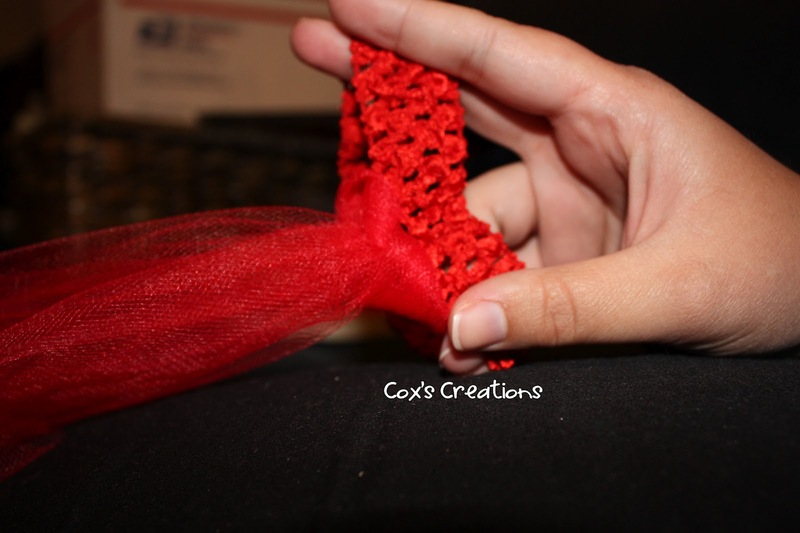 A crochet headband if you have trouble finding any you can get some here. 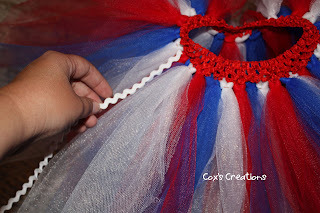 A piece of cardboard cut to the length you want your tutu to be. (Measure from waist to knee and that is usually a good length). 1. First you will cut your tulle. I like to wrap mine around the cardboard piece and as I rotate it front to back I count one-one, two-two etc. so I don't lose count. If you are using the crochet headbands that I used, you will have 33 holes to loop through. 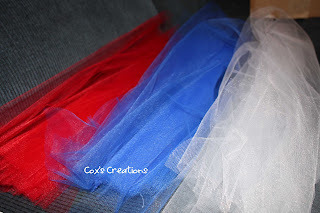 Because I like the look of three layers of tulle in each hole, I would cut 33 of each color. So you would go one your board from front to back 33 times. 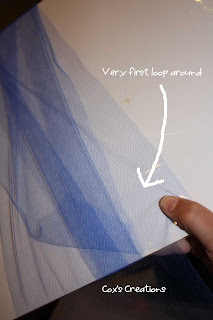 It is very important that you only count wrapping from front to back as one time (not 2), otherwise you will not only be short on tulle...but your tulle will be too short! Be sure to anchor your first loop around so it doesn't slide. I just use my thumb while I wrap it around a couple times, then you can usually let it go and it won't budge. 2. Cut ONLY ONE SIDE of your tulle, this will be where you started off with your first loop of tulle. Note my thumb. You will end up with three sets of 33 strips of tulle in each color. 3. 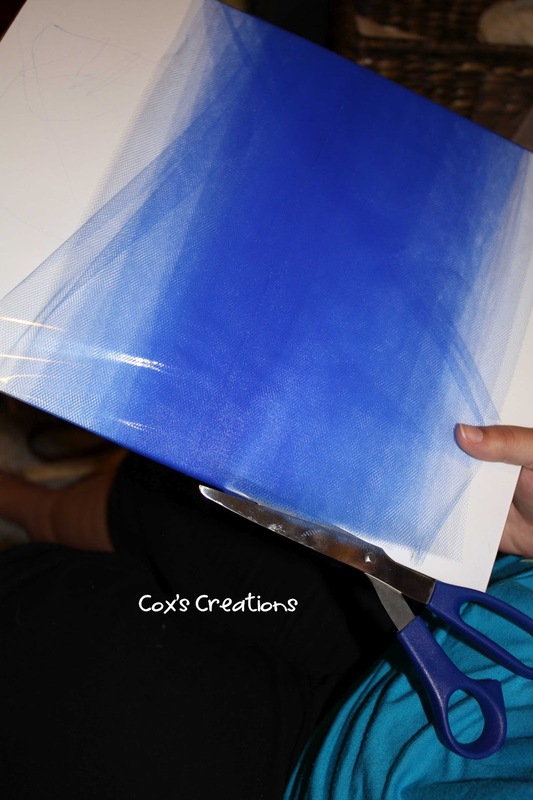 Take THREE strips of your first color and fold them in half. 4. 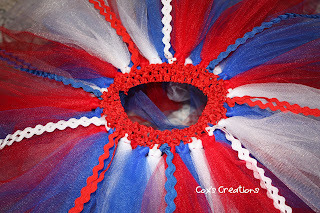 I like to start my tutu at the very seam of the headband. 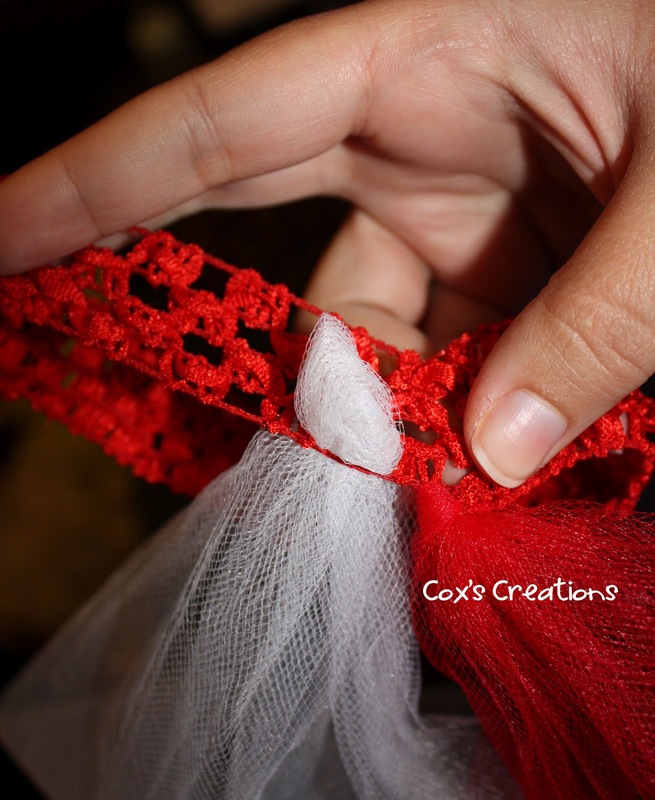 So find your seam and in the hole next to it, push the part of your tulle where it is folded in half through it. See the loop below? That is where the fold is when you folded your tulle in half. These are the little holes you will be putting your tulle through! 5. 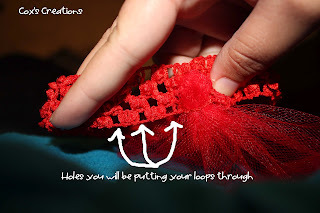 Stick your finger through the loop to make sure all the layers are through. 6. Grab your tail and pull it through the loop. 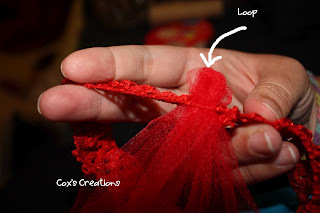 This part gets a little tricky because you want your loop to be pretty snug in that little hole it's in, but if you pull too hard you can break the little elastic. 7. Anchor the little elastic part of your headband with your other hand as your pulling your loop tight. 8. Move on to the next color in your pattern repeating steps 3 to 7. 9. Repeat step 8 with your last color. Then continue your pattern around your Tutu. 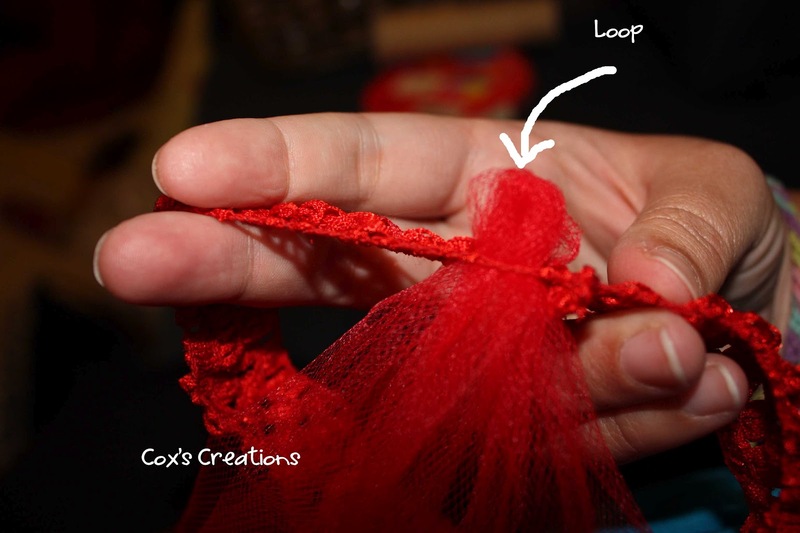 This is how your tutu will start to take shape. You can play around with it to get it a little fluffier, as well as which colors you want to have on top of others since they will overlap some. I usually just straighten out my tulle and call it a day. 10. Once your tutu is finished. 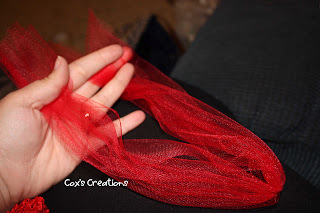 Take your Ric Rac and measure from the top of your tulle layers to the bottom, then fold it in half and cut. So your Ric Rac will be double the length of your tutu unfolded. But folded in half it will be the same length but with two strands. Just like your tulle strips at the beginning. You will need 11 strips of tutu in alternating colors. 11. 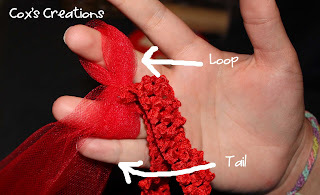 Fold your Ric Rac in half and loop it through a hole that is in between two of the other tulle colors (this is done just like you did with the tulle by pulling the tails through the loop so it doesn't come out). So if it's white it would be between red and blue, if it's red it would be between white and blue, if it's blue it would be between red and white. 12. Evenly space your layer of Ric Rac around your tutu and your finished! I can't get enough of this tutu. It is so stinking cute and your little one will look adorable in it! Please feel free to leave a comment with ANY questions. 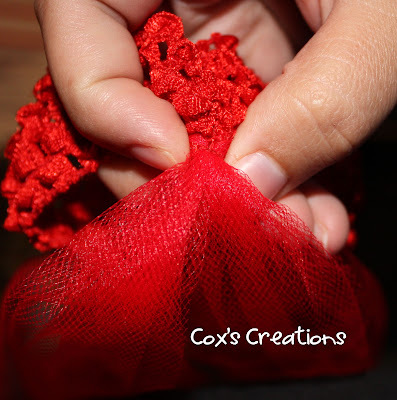 If you enjoyed this tutorial be sure to follow my blog! I have a LOT more fun ones in store for you! 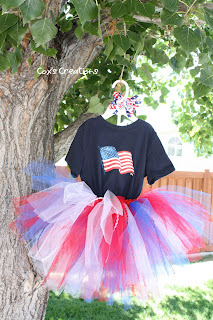 I love the tutu and how patriotic it is! 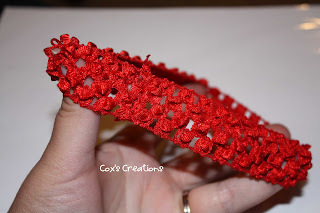 I've never seen the idea to attach it to a crocheted headband before, that's such a great idea!!!! So cute, and such a good cause. I love using crochet headbands! It's so much easier and makes a fuller tutu! Thank you for sharing! This is absolutely adorable! Now I'm really hoping that I have a girl! 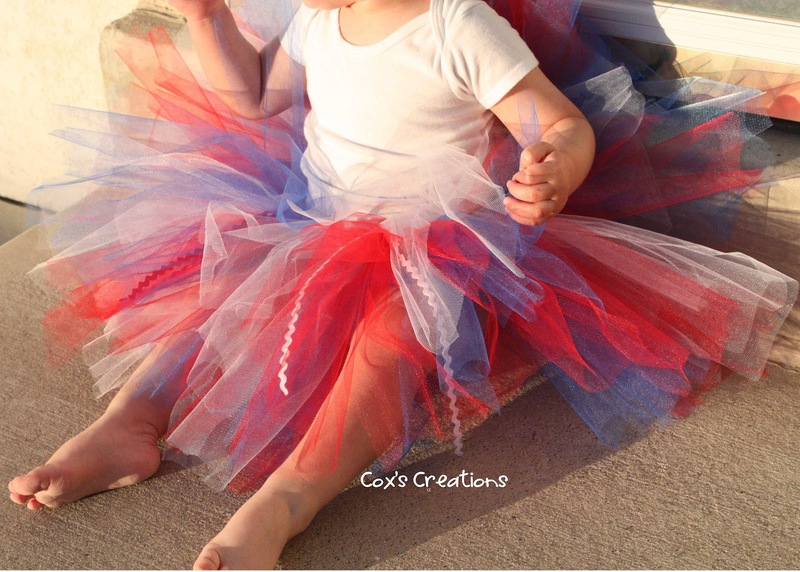 That is so cute, I have been seeing these tutu's around and have been wanting to know how to make one for a while. Thanks for sharing. I'm glad I could help! 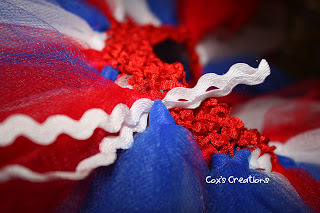 I find using the crochet headband makes it super easy! 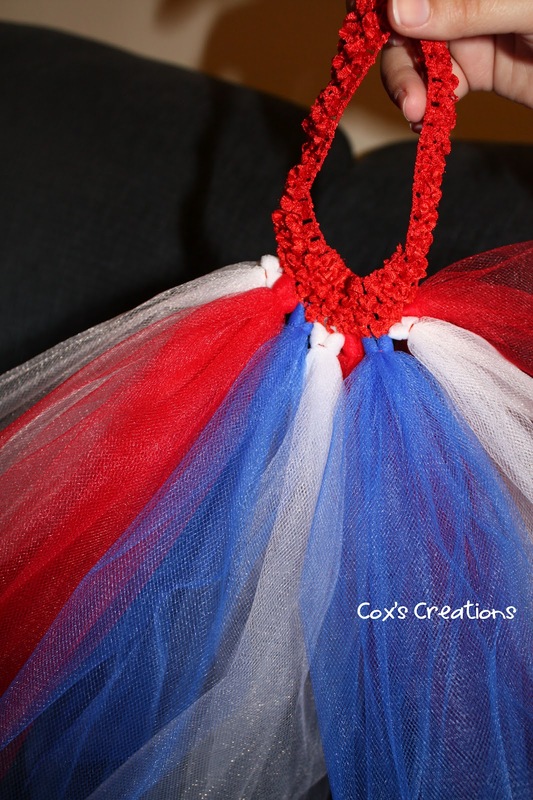 And a fuller tutu! Happy crafting! 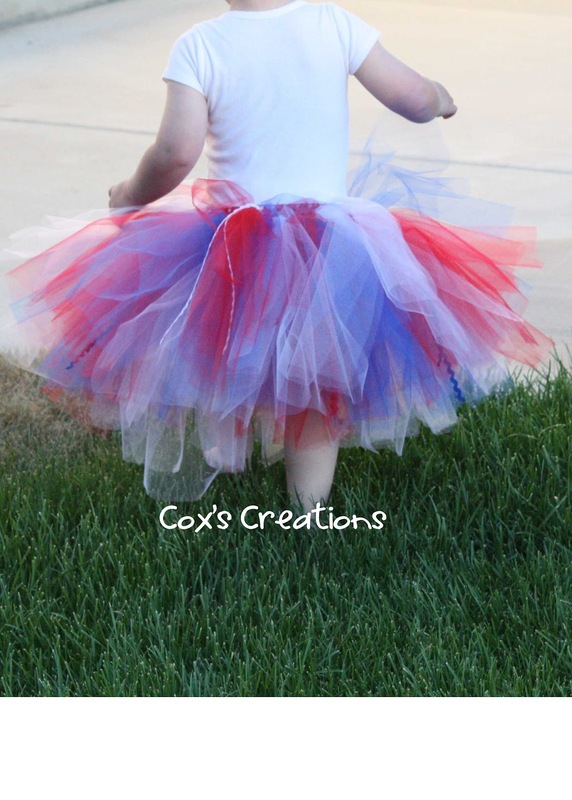 That tutu is so adorable!! I love the bright colors. :) I'm pinning this. I'm so glad you linked up at Romance on a dime. I hope to see you next Tuesday. Thank you so much for stopping by! I'm so glad you liked my tutorial! I put your button up on my places I party page! This is adorable! I love the ric rac element added in there. Found you via Be Different Act Normal! Thank you for stopping by! I liked it too! It adds a fun detail! I'm thinking fun ribbon might make a cute detail as well! I have seen several of these tutu's, but I have never seen one using this type of headband for the waistband. Genius!!! Thanks for sharing at the party! It's one of my favorite features! I'm curious to see if it will fit larger than a 2t but that's the largest I have at home! I wonder if my neighbors will think I'm a creeper if I walked around with a headband asking people to try it on...yeah I probably shouldn't try it! Thank you! I really like that it's no sew! This is such a darling tutu! I love the ric rac ribbon you put through it. So cute!! I am featuring this at todays link party! Wahoo!! Thank you! It really is simple! :) I'll be there! That sure does look cute. You are so clever to make it. Thank you! It was really fun to make! I'll definitely be stopping by your party! 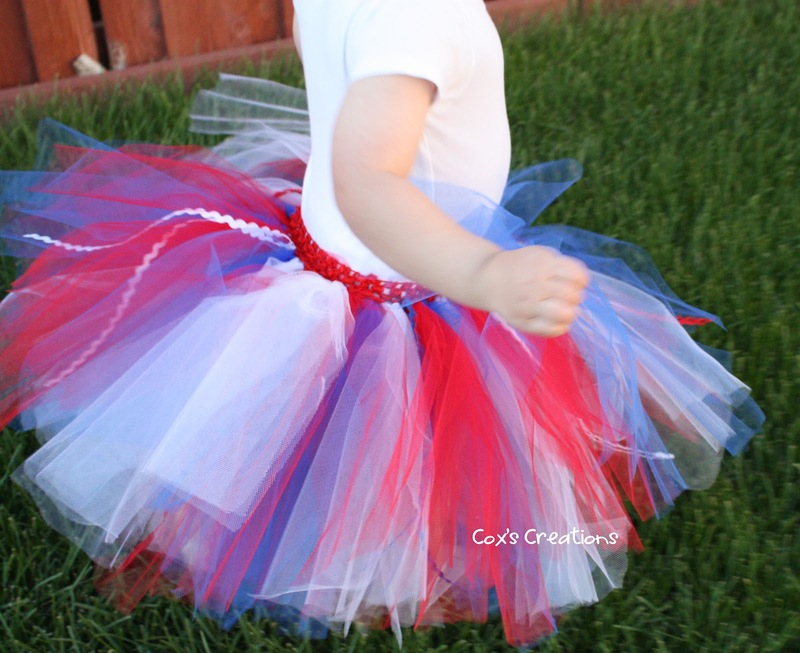 Jess, this tutu is absolutely adorable!!! What little girl wouldn't love to dance around wearing a creation like this!!! I would love you to share your fabulous tutorial at our ongoing linky that's just for Pretend Dress Up Clothes .